Shop Gibson Modern Machine Tuning Heads from AMS and enjoy Fast & Free Shipping. 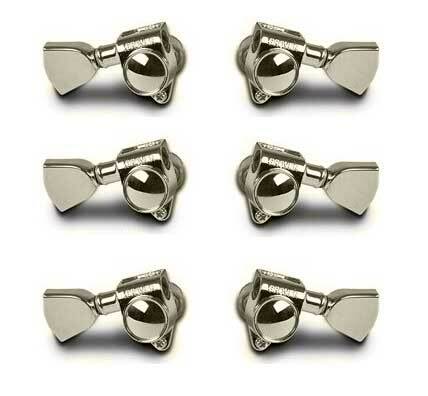 Modern machine heads with metal buttons, available in nickel or gold. 6 individual machine heads per set. Good quality overall. I had to enlarge the holes on my headstock in order to get these machine heads on though, which was a little bit of a pain. I had to by a reamer for $20 which no one had ever heard of at Lowe's, Home Depot, or Sears. Finally I found one at Ace Hardware. Once I got it, it was easy to make the holes bigger, and everything fit nicely. no problems doing install or in daily usage. Labeled as "Gibson" but made by Grover. i beleive these are 14:1? worked to perfection. great job grover! I purchased the gold machine heads. The quality is up to Gibson/Grover standards. These stay in tune much better than the stock tuners I had on my Epiphone Les Paul Custom. A great upgrade to any Gibson or Epi! The tulip shaped heads give the guitar a move traditional Gibson look. Nice and tight feel to them.